If you’re a presidential candidate these days you have to provide definitive proof that you were born in the USA and on May 29, 2012 Mitt Romney released his birth certificate which states ‘born in Detroit, March 12, 1947’, but there’s no birth time. It’s only a certificate of live birth and ‘birthers’ are concerned about the 5 day delay between the birth date and the birth registration that didn’t occur till March 17 and they want him to release his long-form birth certificate. In 2008 a more extreme controversy arose over Barack Obama’s birth place and he released his certificate of live birth and long-form birth certificate to prove he was born in Honolulu, Hawaii. Obama’s certificate of live birth records his birth time, but Romney’s doesn’t so astrologers can only hope that before the US election on November 6 that the long-form certificate, which should record his birth time, will be released. Venus in house 10 is the dominant planet. It’s conjunction MC (the dominant marker), opposition Pluto, trine Neptune, opposition Saturn, semisquare Sun, trine ascendant, trine Uranus, semisextile Mars and mutual reception Mercury. Its net influence (7.76 harmodynes) is fortunate. Planets with above average power are Venus in house 10, Saturn in 3, Sun in 11, Jupiter in 6 and Moon in 6. Best planet is Neptune in 5 – then Jupiter, Venus and Moon. Worst planet is Saturn in 3 – then Uranus, Mercury and Pluto. Dominant aspect is Sun parallel Mercury in 11 – then Jupiter parallel MC, Moon conjunction Jupiter and Saturn parallel ascendant. Best aspect is Venus in 10 trine Neptune in 5 – then Neptune trine MC, Neptune sextile Pluto and Jupiter parallel MC. Worst aspect is Saturn in 3 opposition MC – then Moon opposition ascendant, Pluto opposition MC and Venus opposition Saturn. Dominant house is 10 – then 11, 6, 1 and 3. Best house is 6 – then 5, 7 and 8. Worst house is 3 – then 1, 9 and 10. Venus sign is Aquarius – I know – first decanate – Originality. 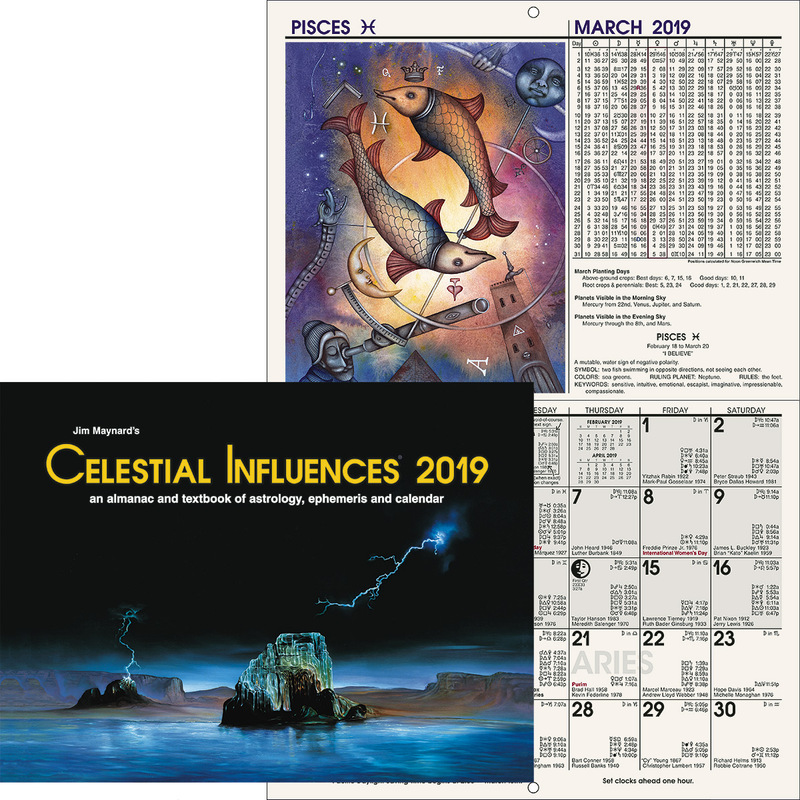 Sun sign is Pisces – I believe – third decanate – Vicissitudes. Moon sign is Scorpio – third decanate – Attainment. Ascendant sign is Gemini – I think – first decanate – Intuition. The chart’s best markers are Neptune, Scorpio, Venus trine Neptune and house 6. And its trouble spots are Saturn, Leo, Saturn opposition MC and house 3. Major deficit is weak Mars. Venus – the dominant planet – in house 10 is conjunction MC, trine Neptune and opposition Pluto. The Moon-Jupiter conjunction in house 6 is trine the Sun; and the Sun in house 11 is conjunction and parallel Mercury. These dominant markers tell his life story. There are 11 trine aspects and 6 opposition aspects. Venus-ascendant and Neptune form a grand trine; MC, ascendant and Neptune form a grand trine; and Venus, Uranus and Neptune form a grand trine so there are three grand trines. 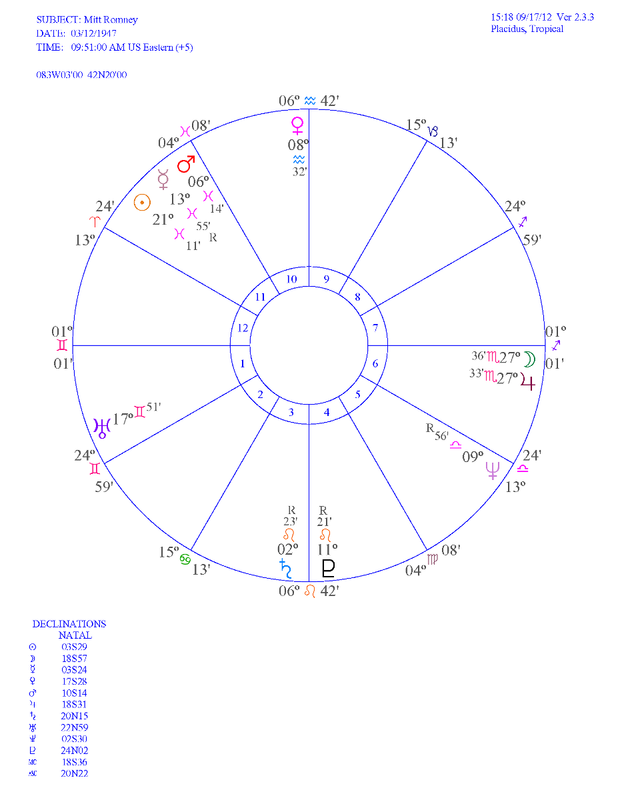 Neptune in house 5 conciliates the Venus-MC- Pluto opposition so the Venus-Pluto discord has a harmonious outlet. But Saturn and Uranus are the cusp rulers of the MC and Saturn is opposition MC and Uranus is square Sun. The very prominent eleventh house marks for a life experience shaped by friends who provide influence and support. The weak Mars marks for low level physical energy and a lack of initiative when the problem situation calls for enterprise and fast action. Mitt Romney is a Mormon. Jupiter, the planet of conventional religion, is conjunction Moon, planet of first impressions. It was stationary when he was born. Then on January 15, 1949, when he was two years old, Jupiter turned retrograde and formed a progressed conjunction aspect with birthchart Jupiter and the Moon. These conjunctions had a prominent influence on his life experience from 1949 to 1974. But Saturn, the planet of fear and fundamentalism, is cusp ruler of house 9 (religion) so his conservative (Saturn) religious beliefs (Pisces) have a loss (Saturn) influence on his life: And with Saturn aspecting Venus, MC and ascendant this loss influence extends to his reputation (MC) and personality (ascendant). In July 1966 Mitt Romney traveled to France as a Mormon missionary. At this time in his chart progressed Mercury (at 13 Pisces 07) in house 11 – planet of travel and co-ruler of his personality – had moved to form a prominence (conjunction) aspect with birthchart Mercury: And progressed Venus – the dominant planet (at 1 Pisces 13) in house 10 – had moved to form an expansion (inconjunct) aspect with progressed Saturn (at 1 Leo 57R) – cusp ruler of house 9 (religion and overseas trips) – in house 3. This aspect activated their natal opposition. Then in June 1968, whilst doing missionary work in France, Romney had a life changing experience. He was driving on a mountain road when his car was struck by an oncoming vehicle. One of his colleagues was killed in the accident and he and the others were severely injured. And Romney spent several months in hospital – turning to his Mormon faith for emotional healing. 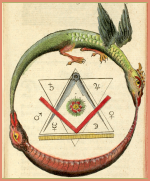 At this time in his chart progressed Mars (at 22 Pisces 55) – planet of accidents in house 11– had moved to form an obstacle (square) aspect with progressed ascendant at 23 Gemini 39: And progressed MC (at 27 Aquarius 49) in house 10 had moved to form an obstacle (square) aspect with birthchart Moon (cusp ruler of house 3 – driving) and an obstacle (square) aspect with birthchart Jupiter (cusp ruler of house 8 – death). Mars is cusp ruler of house 12, the hospital where he convalesced, and Jupiter in house 6 mapped the medical care he received from doctors and nurses. The progressed Mars-ascendant square aspect that placed his physical wellbeing in grave danger had moved into effective orb in April 1959 and stayed around till August 1970. And if the accident occurred before June 12, 1968 progressed Moon (at 6 Pisces in house 5) would have been opposition birthchart Mars in house 11. Mitt Romney is a very successful and very wealthy businessman. In his chart the business planets – Jupiter and Saturn – form a luck (trine) aspect. They both have above average power; and Venus in house 10 (business) – the dominant planet – is involved in two grand trines. Jupiter – the wealth magnet – is trine Sun and conjunction and parallel Moon. It’s in house 6 (work) and is cusp ruler of house 8 (other people’s money). The Sun is in house 11 and his friends and associates include powerful politicians. Much of his success is due to their influence – he’s a friends made man. Mercury, cusp ruler of house 2 (his personal finances), is conjunction and parallel Sun and when two planets form conjunction and parallel aspects the astrodyne power of each aspect can be combined. So Sun conjunction and parallel Mercury has a net power of 17.55 astrodynes. And Moon conjunction and parallel Jupiter has a net power of 17.14 astrodynes. 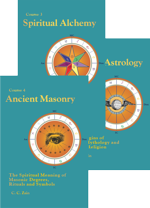 These aspects in his birthchart map the dominant thought compounds in his unconscious-mind. In 1977 Romney joined Bain and Company and in 1978 became a vice-president of the firm. He left Bain in 1984 but in 1990, when the company was facing financial collapse, was asked to return. In January 1991 he became Bain’s new CEO. So Romney has had a lot of business experience and success. It was guaranteed in 1961 when progressed Neptune in his chart in house 5 moved to form a luck (trine) aspect with birthchart Venus and for the next forty years he’s had a non-stop supply of good luck and lucky breaks influencing his business interests (house 10) and risk taking (house 5). So if you conclude that his business success has been due more to luck than expertise you could be right. And when it comes to money Neptune is a big thinker. It wants hundreds of millions – then billions – of dollars. So Mitt Romney got educated, got married, had kids and went into business. He made a lot of money, spent a lot of money and gave a lot away. He got elected governor of Massachusetts and now wants to be president. The Sun is in the Vicissitude decanate of Pisces so he’s had an eventful life pursuing and succeeding at a variety of careers. He’s adaptable and likable and has a yen for excitement and change. The Moon is in the Attainment decanate of Scorpio so he has intense emotions and vivid ideas. His wife stimulates his ambitions and ideals and he’s capable of lofty effort for home and country. And the ascendant is in the Intuition decanate of Gemini so he has the ability to perceive all the details of a problem and put them into proper perspective. But don’t let that ‘intellectual’ Gemini front fool you. With the Sun in Pisces, Moon in Scorpio and Venus dominant he’s all emotion. With this decanate profile the life he lives will be shaped by vicissitudes, attainment, intuition – and his friends. Mitt Romney and Paul Ryan have a powerful astrological connection. Romney’s dominant Venus (at 8 Aquarius 33) and Ryan’s dominant Sun (at 9 Aquarius 01) are within one degree of a conjunction aspect. Progressed Sun (at 25 Taurus 32 and 19N09) in house 12 has moved to form an agitation (sesquisquare) aspect with birthchart Neptune in house 5; and intensity (parallel) aspects with birthchart Jupiter and progressed Saturn (at 20N01). Sun parallel Jupiter adds harmony, Sun parallel Saturn adds discord and the Sun-Neptune (agitation) discord is reduced because Neptune is high in harmony. Progressed Sun is also parallel birthchart Moon, progressed Mercury and birthchart MC, but they’re neutral aspects so they contribute power, but no harmony. Progressed Uranus (at 20 Gemini 19) in house 1 has moved to form an obstacle (square) aspect to birthchart Sun. It indicates that the very big obstacle thwarting his political aspirations (Sun) is his personality. Getting a new job puts the onus on his tenth house thought-cells and their strength and functional integrity on November 6, 2012 is revealed by the progressed aspects influencing the tenth house on election-day. In the birthchart it has 7.50 discordynes so he has an astrological predisposition to experience problems with his career and business interests. Venus, MC, Saturn and Uranus are the rulers so their progressions hold the key to what happens. Progressed Venus (at 26 Aries 37) in house 12 – the dominant planet and ruler of house 10 – has moved to form a prominence (conjunction) aspect with progressed Mars (at 27 Aries 05). It brings disappointment, secrets, hospitals and relief into prominence, but adds no harmony or discord. And progressed Neptune (at 8 Libra 19) in house 5 is still within an effective one degree orb of a luck (trine) aspect with birthchart Venus in house 10. So this aspect is adding lots of harmony to the all important tenth house. If his birthtime is almost accurate progressed MC at (11 Aries 03) in house 11 has moved to form a luck (trine) aspect with birthchart and progressed Pluto (at 11 Leo 06) in house 4. But it’s not as good as it looks because it activates a birthchart opposition that’s the third worst aspect in the chart. Progressed MC (at 4N22) has moved to form intensity (parallel) aspects with birthchart Sun and birthchart Mercury but they’re neutral aspects so there’s no added harmony. Progressed Sun (at 19N09) in house 12 has moved to form an intensity (parallel) aspect with progressed Saturn (at 20N01) in house 3: And progressed Saturn (at 3 Leo 36) has moved to form a friction (semisquare) aspect with birthchart Uranus in house 1. These aspects and the previously mentioned Sun-Uranus progressed square all add discord to the tenth house. There are three very important progressions involving planets with above average power in his chart on November 6, 2012. Progressed Mars (at 27 Aries 05) in house 12 has moved to form expansion (inconjunct) aspects with birthchart Jupiter and birthchart Moon in house 6. The Mars-Jupiter expansion aspect started in February 2012 and stimulated his capacity to get financial backing from friends and strangers – Jupiter rules house 8 (other people’s money), house 7 (strangers) and house 11 (friends). Progressed Mercury at (27 Taurus 11) in house 12 (disappointment) has moved to form separation (opposition) aspects with birthchart Jupiter and birthchart Moon. The Mercury-Jupiter opposition started on July 25, 2012 so it’s a recent arrival. Mercury rules house 2 – his money – and Jupiter rules house 8 – the other person’s money – and since then he’s been spending his and theirs like there’s no tomorrow. He’s being separated from his money. House 8 also rules taxes. Jupiter is the planet of religion and Mercury is cusp ruler of house 1 (him) so his religion has become a personal problem. The Mercury-Moon opposition started on August 4, 2012 so it’s a recent arrival too. It marks for mental conflicts, saying the wrong thing, bad decisions and nervousness. And progressed ascendant (at 28 Cancer 02) in house 3 has moved to form a luck (trine) aspect with birthchart Moon and Jupiter. This aspect activates a birthchart opposition so it’s not as good as it looks and it’s only in orb if the birthtime is almost accurate. So on election-day one of the strongest aspects in his chart – Moon conjunction Jupiter – is turned on, but it doesn’t directly influence house 10. And progressed Mercury and progressed Sun are in house 12 – let downs and disappointment. 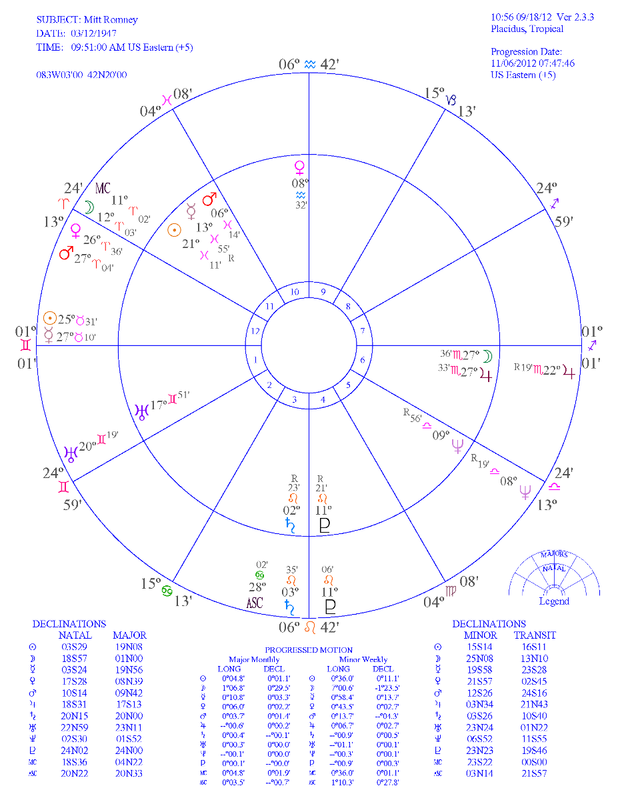 So Romney’s birthchart and progressed Sun are involved in three discordant aspects and his tenth house (just like Obama’s) is a mix of harmonious and discordant aspects. Progressed Neptune trine birthchart Venus is providing harmonious good-luck, but progressed Venus conjunction progressed Mars is neutral. All the aspects involving Saturn and Uranus are adding discord; and if progressed MC is trine birthchart and progressed Pluto its harmony is severely reduced. Mitt Romney has a Gemini personality and Barack Obama has an Aquarian personality. Gemini is a changeable air sign. It lacks concentration and marks for changeable or scattered thinking so it’s not good at debating. It explains why Romney can change his stance on important social and political issues. Aquarius is a fixed air sign. It marks for focused, settled thoughts and has excellent concentration. It’s the zodiac’s star debater. Mercury is the planet of expression and communication so when it comes to talking the political talk progressed Mercury opposition birthchart Moon in Romney’s chart is a big liability and progressed Sun sextile birthchart Mercury in Obama’s chart is a big asset so it’s a very safe bet that Obama will win the debates.